Lend your name to continue Berta Cáceres’ struggle to protect the Gualcarque River and indigenous territories in Honduras from megaprojects like the Agua Zarca hydroelectric dam. An end to the Agua Zarca hydroelectric dam project, and demand respect for Indigenous Peoples’ rights to Free, Prior, and Informed Consent. Protections for the members of the Civic Council of Grassroots Indigenous Organizations of Honduras (COPINH), who continue the struggle and are still facing harsh repression and violence for defending their territory against the Agua Zarca dam. 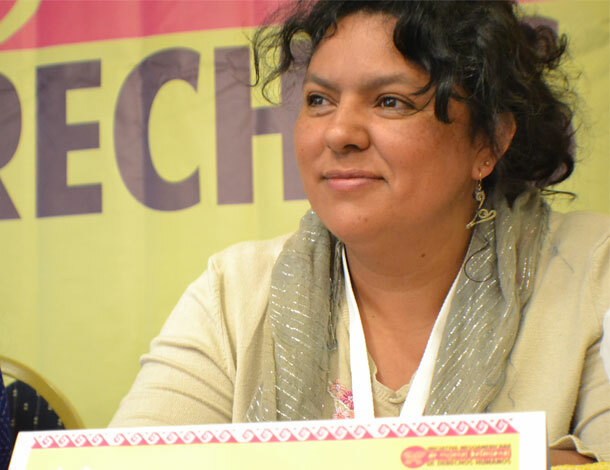 An independent, impartial, and transparent investigation by the Inter American Commission of Human Rights into Berta’s assassination, and the protection and immediate release of Gustavo Castro, the Mexican human rights defender who witnessed Berta’s murder and has been prevented from safely returning home to Mexico. The immediate withdrawal of all funding of Agua Zarca and other projects threatening Lenca and indigenous territories in Honduras.